A couple of exhibition model 400 cc Hondas revealed at the Tokyo Motorcycle Show combine old styling influences with new-tech functionality. 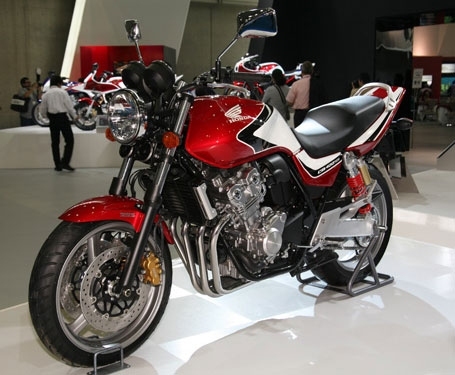 The CB400SF and CB400SB use a fuel-injected, liquid-cooled four-cylinder motor with “Hyper V-TEC” for variable valve timing. They’re both fitted with ABS brakes and twin rear shocks. A retro-style fairing is fitted to the SB (which stands for Super Bol D’or) while the SF model is naked. They will be marketed, but no word on whether you’ll see them in North America. Previous PostMotorcycles bad, money goodNext PostMoto GP ? Rookies everywhere! Given that the article is 8 years old, I suspect that they won’t make it to N.A. anytime soon. 😉 That said, these are available on the grey market. 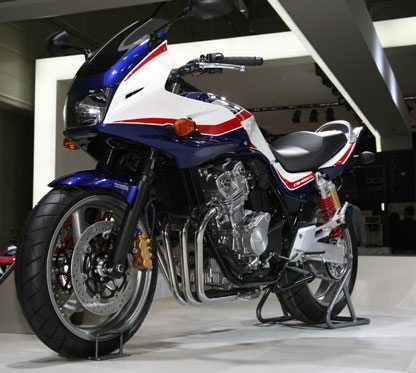 Find a seller in Japan who is willing to ship overseas and you’ll have yourself a lovely bike. They’re still being produced and are one of my favourite bikes in Honda’s lineup. Having owned both a CB400F and a 500VFR Intercepter, I love the fully faired version. Honda Canada you have a winner … build it please. I like this new retro trend.